The unofficial website of the food police.. fun stuff! More rules of thumb: If candidates for less-known offices (especially incumbent candidates) don't have the guts to tell the public about who they are, their record, etc... skip 'em. Remember: This isn't "take a guess" or vote for the person you always see on TV. If you don't know about a race or proposition, SKIP IT. You will NOT invalidate your ballot. ... but this cross is now part of the new Memorial. Despite efforts to remove God from the observance on Sunday, it is always clear that Devine power shines through, in spite of "politically correct" politicians. There will be plenty of prayer in the crowd... and across America. 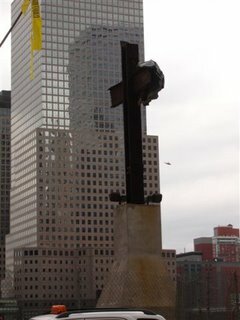 NOTE: This is where the cross stood on the 5th anniversary in New York City. Now it's installed inside the new center. 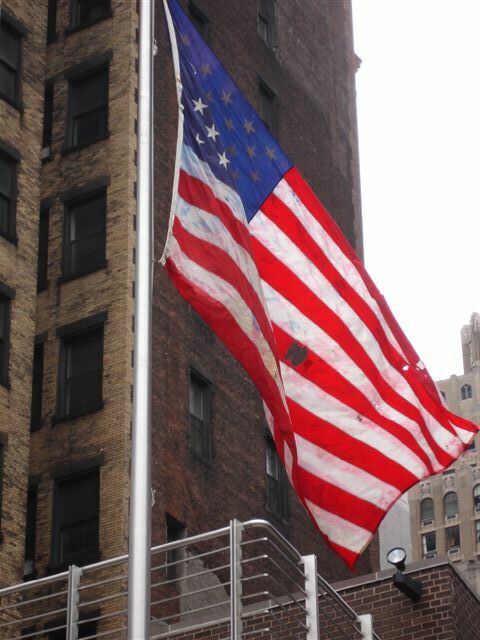 This flag flew over a firehouse next to Ground Zero on 9/11/01. The building was destroyed when the Twin Towers fell. I took this photo as it was flying again over a rebuilt station on the 5th anniversary of the attacks in New York. For additional photos and observations on 9/11/06, go to SEPTEMBER 2006 link to the right and scroll down.